The information that Creswick was an associate of the Century Guild from roughly 1886 to 1888 comes from Mapping Sculpture (2). in about 1886, Creswick collaborated with A H Mackmurdo in creating the sculpted panels for a buffet [a sideboard or recessed cupboard for china, plate etc.] The Century Guild was considered to be among the most influential groups of the Arts and Crafts movement. Creswick exhibited with them in London, Manchester and Liverpool and contributed work to their exhibition stands at: The Inventions Exhibition London 1885, International Exhibition of Navigation Commerce and Industry, in Liverpool 1886 and the Jubilee Exhibition, Manchester 1887 (3). Ogden reports that Henry Boddington, a Manchester brewer, bought up the Guild’s Liverpool stand completely and he commissioned the Guild to undertake most of the decoration of his residence, Pownall Hall in Wilmslow. Creswick designed the supporting figures for the Mantelpiece in the dining room, which have been variously described as ‘miners’ and ‘guilded Atlantes’ (4) Creswicks down to earth approach would make it more likely that they were intended to be miners. Although Creswick took commissions for allegorical figures, he seldom made classical references in his work. Ogden points out that Creswick seems to have remained uninvolved in the intellectual pursuits of the artistic movements with which he was associated and their political interests. He did not become a member of the Mackmurdo commune or contribute to the Guild publication, the Hobby Horse, the iconic journal ‘whose contributors looked at art from a scholarly perspective’. Creswick is frequently described as a genial man and often worked in collaboration with other craftsmen. 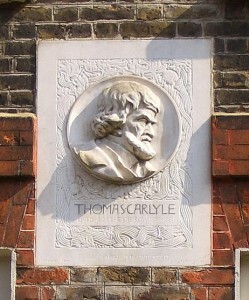 He would have shared the Guild’s views on the essential aims of craftsmanship and the ‘unity of art’, ‘high’ and ‘low’. However, as Ogden points out, he came from a completely different background to that of his colleagues in the Century Guild. Creswick was of artisan stock, a man who was married with a large family to support and so was unlikely to take to their Bohemian lifestyle and intellectualism. By 1886, Creswick had a studio in Newman St, Camden, London. 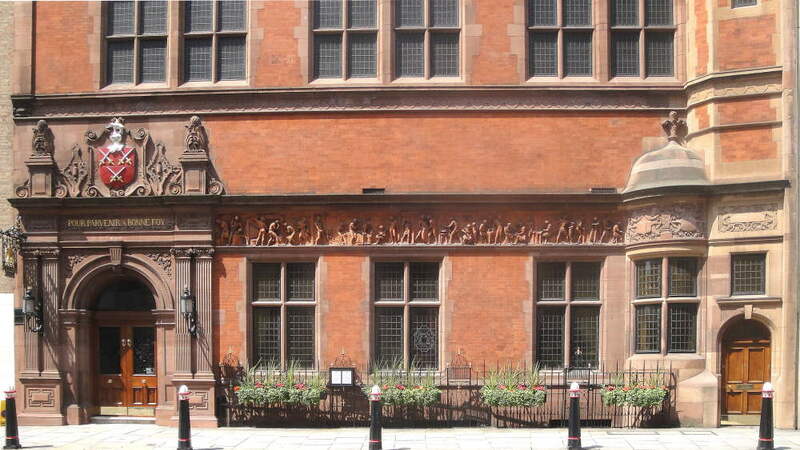 His major work, the terra cotta frieze on the facade of the Hall of the Worshipful Company of Cutlers, Warwick Lane in the City of London, was commissioned at this time, It is dated 1887 (5). This large and prestigious work gave Creswick the chance to demonstrate his individual style: encapsulating the clarity of ‘sight’ which was the result of Ruskin’s training together with ‘The Master’s’ belief in the power of sculpture to enhance architecture with narrative and meaning. Ruskin had recorded that in The Seven Lamps of Architecture (6) which Creswick clearly took to his heart. Ruskin’s Cambridge school of Art: Inaugural Address (1858) gives a clear insight into his view of the premier importance of ‘sight’ (7). In the Cutler’s Hall frieze, Creswick illustrated the manufacturing process in which he had worked himself, with honesty and understanding, in this major work. The prestigious nature of this commission would have continued to be helpful to him in the long term. Having such a successful London commission helped Creswick enormously in his career. It provided him with an exemplar for future patrons. Indeed, he continued his theme of the dignity of the working man throughout his working life as a sculptor. His powerful portrayal stemmed from personal experience given that he had worked as one whose everyday work could cause death and almost without exception caused serious damage to health. Creswick portrayed the working man from the heart. It is Ogden who cites the recurring though so far unsubstantiated belief the working men who Creswick portrayed were recognisable portraits of the men he had worked with: the Sheffield ‘men of iron’ so admired by Ruskin on his visits to Walkley and its environs (8). Given Creswick’s facility with portraiture it seems reasonable to suppose that they were the remembered faces of his former colleagues. 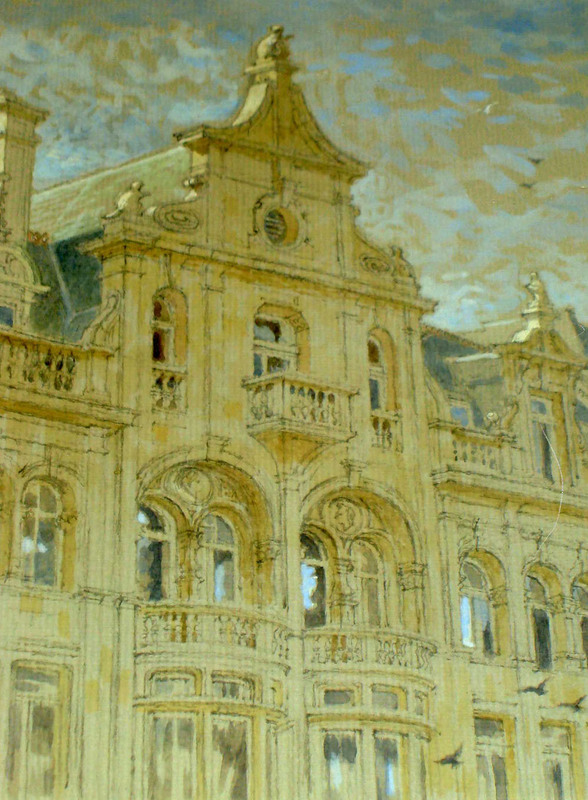 ‘the work showed a development in Creswick’s style in that the figures on the lower relief are more integrated into the building’s overall design’. Sadly, this work has in the main been destroyed. One feature remains: the sculpted beavers that still happily gambol over the gables of the building (unlike their brothers who were made into hats). It is a reminder of Creswick’s continuing loyalty to Ruskin that he sent his designs to his mentor. It is to be hoped that Ruskin, now failing in health and towards the end of his active career, derived some pleasure from the success of his former pupil. This comment can be said of Creswick’s work throughout his career. The refinement of his techniques and the closer relationship to the surrounding architecture did not diminish his sympathetic truthfulness to those whose work and leisure pursuits he continued to celebrate. 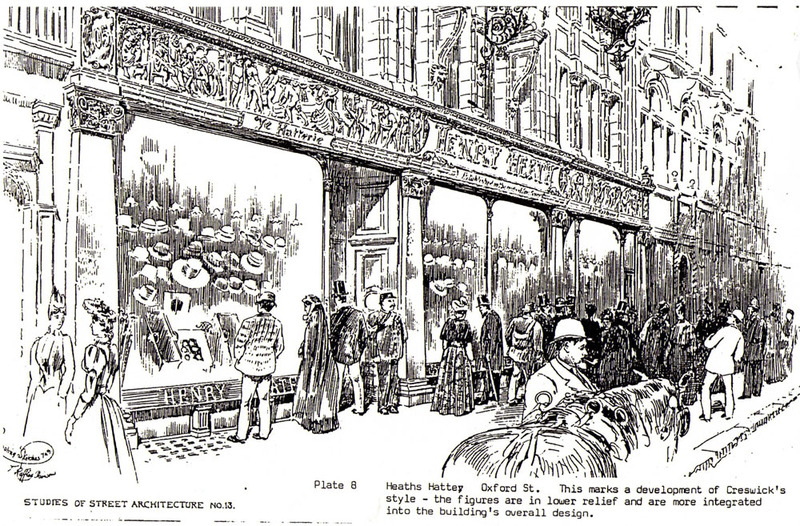 Ogden mentions that Goodall and Sons carried out the production work on the Hatters in Oxford Street. About 1888, the Creswick’s next child – the seventh, another girl – was born in Manchester. She was named Edith. The family’s address at the time is listed as 20 Snowdon Street, Higher Broughton, Manchester. 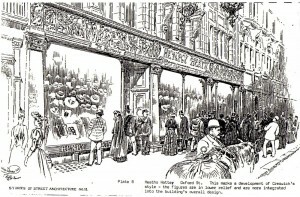 No doubt Creswick was in Manchester at this time in connection with the Century Guild’s presence at the 1887 Jubilee Exhibition. Also in 1888, Creswick exhibited with the Century Guild at the first Arts and Crafts Society Exhibition in which he contributed twelve out of the Guild’s thirty-four exhibits. 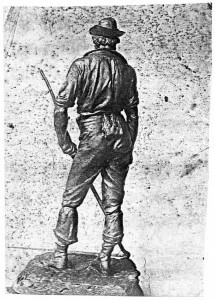 Titles such as Man with Scythe, Man with Hay Pike, A True Workman and Grinder and Miner at Work show his commitment to portraying the working man and his work, in city or countryside. He also exhibited at The Royal Academy, London, showing a statuette, Manly Pride: study of a smith at work, and at the Walker Art Gallery Liverpool (12). Creswick’s next move is one that saw a major change in his career. He was ‘headhunted’ by the new Birmingham Municipal School of Art, Central School. In January 1889, he was appointed head teacher of Modelling and Modelled Design (13). The chairman of the appointments committee was George Baker on whose house, Beaucastle in Bewdley, Creswick had worked at the instigation of Ruskin in 1879. That both men were still acquaintances is clear from the fact that Creswick was referred to as ‘practically a Bewdley Companion’ (see Wardle and Quayle, 2007). There is also a reference to another cast dating from 1887 that Creswick made of his bust of Ruskin, which was given to Margaret Harley, one of the ‘Mulberry Cottage’ Ruskin adherents who had moved to Bewdley with her husband Thomas to live by Ruskinian principles. The Birmingham Municipal School of Art proved to be a seedbed not only for Creswick’s creative growth but that of his students and through the enlightened approach of the Art School students in all disciplins. (16). Ogden informs us that it was the Birmingham Municipal School of Art was originally set up in 1884 funded by the profits from the newly municipalised Gas Company, this Municipal School of Art the first of its kind in Britain, had a plaque over its door stating that ‘By the Gains of Industry, We Promote Art’. The students were taught by a staff compliment that was headed by Edward Taylor who was in favour of practical experience for pupils, which made him ‘something of a pioneer of this teaching’. Taylor was a strong supporter of the Arts and Crafts Movement. The teaching staff soon included craftsmen and women who were at the forefront of the City of Birmingham’s revival of the Guild system – a system that fostered the association of artists from all disciplines from the traditional such as metalwork to those who were part of the crafts revival. The Guild system led to a revival of crafts such as Stained Glass, which had survived as a craft but had become a process of the sort that Ruskin fulminated against. He argued against systems of divided labour in which no craftsman was allowed to carry out production from design to a finished product. 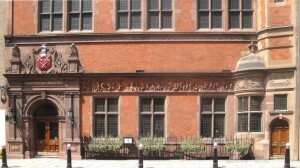 Crawford describes how the School of Art became the organisational centre of the Arts and Crafts Movement in Birmingham. This enabled it to restore the role of the artist craftsman who could produce a complete work of art, take pride in his work in a company of equals and supply the city with educated craftsmen and women. In addition to Creswick, modelling master, the teaching staff included A.J. Gaskina former pupil at he school, who went on to teach in a department of book illustration. By the early 1890s, Bernard Sleigh also a former pupil was teaching stained glass techniques with Henry Payne., Mary Newill, another former pupil, taught needlework – another revived craft . There was also Bernard Sleigh who taught decorative painting and many more. (5) Sheffield Independent 31st December, 1888 syndicated article from The Contract Journal ‘of last week’ and The British Architect, April 6 vol. 29 1888 most of these articles are based on the detailed description by T Raffles Davison. (14) Peter Wardle and Cedric Quayle 2007 pp 6 and 34and 35 also note 7. (16) This whole section is informed by Alan Crawford’s ed. By Hammer and Hand, The Arts and Crafts Movement in Birmingham, 1984 Birmingham Museums and Art Gallery. This is an indication of the integral part that the School of Art played in the Arts and crafts movement in Birmingham.